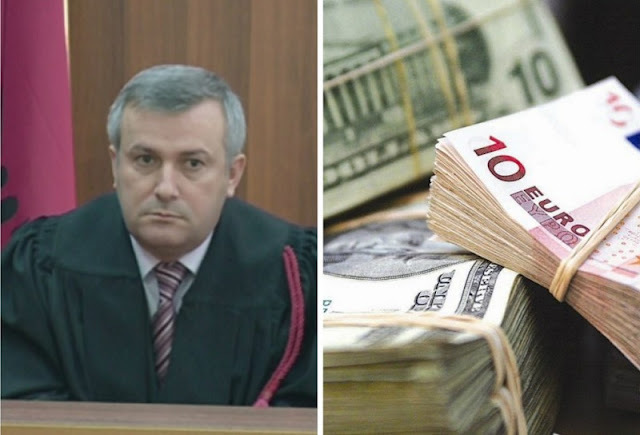 Former Judge of the Court of Appeal in Tirana, Shkëlqim Miri has been sentenced to 2 years and 6 months for corruption. The Prosecution for Serious Crimes demanded 4 years in prison for former Judge Shkëlqim Miri, but the Court accepted the shortened sentence for him by serving a total sentence of 2 years and 6 months in prison. Shkëlqim Miri was arrested on November 10 last year under corruption charges. He is accused of having bribed 30,000 euros in exchange for a more favorable decision to Gentian Doda accused of murder in 1997. We remind that based on controls on his apartment, police found about 30 million Lek. Miri said this money were of his friend who would buy a property in Tirana while the rest were salary savings. Shkëlqim Miri sought freedom by the Appel Court, but his request was rejected. The former judge was a member of the HCJ until 2012 and earlier Court of Appeal judge in Durrës (before 2010). Among the sensational issues was that of of Gerdec, where he has been part of one of the court proceedings. Mat's Prosecution has demanded a 20-year jail sentence for Gentian Doda, extradited by the US in 2012, charged with the assassination of Gazmir Dedja and Asllan Gjoka, in October 1997. The author Gentian Doda and the victim Gazmir Dedja were members of rival groups in Burrel, the conflict between them continued for many years and with many victims. The fierce clashes between the two rival groups have been extended to other cities. In 2010, the brother of the victim, Halil Dedja was killed in Tirana - found dead at the entrance of the palace where he lived. On the day of the 1997 incident, the author Gentian Doda and the victim Gazmir Dedja were verbally contradicted and then the defendant fired him with the Kalashnikov, injuring him severely. While Asllan Gjoka died accidentally of bullets. The wounded could survive only two days due to the heavy injuries and managed to tell his family who had shot him, identifying Gentian Dodja. Immediately after the crime, the defendant left Albania and was arrested in 2012 in the United States based in an international arrest warrant issued by the Albanian authorities. Following the extradition, the accused requested resettlement and revision of the previous conviction handed down against him for this criminal offense.